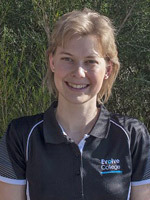 Ainslie completed her Diploma of Remedial Massage at Evolve College as well as her technical and practical training earlier in 2018. Ainslie has been involved in natural health care for as long as she can remember due to seeing it first-hand in her family from an early age. As a child in a household affected by long-term illness, she was exposed to a range of natural health options including massage therapy. A very gifted masseur treated the whole family very effectively for many years and Ainslie saw the benefit a skilled masseur could have. This influence sparked her interest in the benefits massage treatment can have on the body and a person’s general wellbeing. Unfortunately, Ainslie sustained a significant injury to her wrist late in her secondary education which prevented her from pursuing a qualification in massage therapy. Allowing her body to heal Ainslie worked as a dental nurse and administrator. However, after her wrist was fully recovered, she decided to explore her desire to study and to practice remedial massage. She loves feeling like she has helped improve a person’s way of life. She looks at a patient as a whole and works with the patient to improve general wellbeing. She is able to treat a wide variety of patients and looks for the cause of the issue, rather than just treating the symptoms.